Henry Downey with the Sam Maguire! 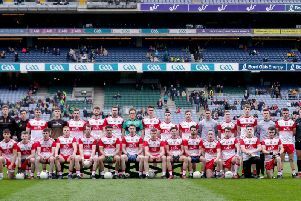 Derry GAA supporters will have the opportunity to celebrate the biggest day in the county’s history in the coming weeks and months at two special events to mark the silver jubilee of the Oak Leafers’ 1993 All-Ireland Senior Football triumph. First up is a golf classic at Moyola Park Golf Club on Friday 17th August where Derry fans who fancy themselves as budding Rory McIlroys can test their skills against their heroes while helping to raise funds for Macmillan Cancer Care. Dublin legends John O'Leary and Charlie Redmond, and Ulster All-Ireland winners Peter Canavan and Benny Tierney, are among those joining the '93 squad as they test themselves against the Moyola course. The squad will undoubtedly demonstrate that the competitive spirit imbued in them by the late, great Eamonn Coleman still burns brightly and rumour has it that Brian McGilligan’s artistry around the greens is a joy to behold. Following that, on Saturday 10th November, a Gala Evening will take place at the Tullyglass Hotel. This will be hosted by BBC commentator, Thomas Niblock. Both the golf and the dinner will enable players, supporters and special guests to enjoy each others company and revel in the memories of the glorious campaign. Fittingly the events are being generously supported by Sperrin Metal, the company whose name was emblazoned on Derry’s famous red and white jersey in their year of triumph. As part of one of the great traditions of the GAA, the man who lifted the Sam Maguire, Henry Downey, will once again lead his team on to the hallowed turf at Croke Park on September 2nd when they are presented to the crowd at this year’s All-Ireland senior football final. And the Lavey man says he’s looking forward to meeting up with his former team-mates, and Derry supporters to share stories of the greatest year in the county’s history. "It’s hard to believe that 25 years have passed since we won the Sam Maguire. There’s a special bond that develops between a team that brings a county its first ever All-Ireland and it’s going to be fantastic to meet up with everyone. Of course in a sense it will be bittersweet with the fact Eamonn is no longer with us but it will be an opportunity for the players and supporters to remember his legacy as we celebrate the successes of 1993. "It’s going be fantastic to bring that group of people back together, there are some great yarns from that season, and I’m sure both the golf day and the gala dinner will be great craic and everyone who comes along will have a really enjoyable time.” said Downey. Tickets for the Gala Evening at the Tullyglass Hotel can be purchased by contacting Owenbeg Derry GAA Centre on (028) 777 42990.